The World Bank (French: Banque mondiale )  is an international financial institution that provides loans  to countries of the world for capital programs . It comprises two institutions: the International Bank for Reconstruction and Development (IBRD), and the International Development Association (IDA). 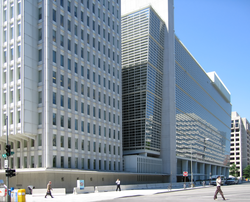 The World Bank is a component of the World Bank Group . 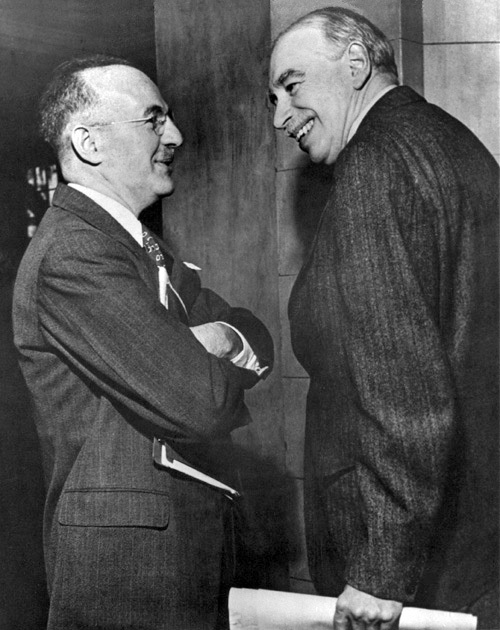 The World Bank was created at the 1944 Bretton Woods Conference , along with three other institutions, including the International Monetary Fund (IMF). The president of the World Bank is, traditionally, an American. 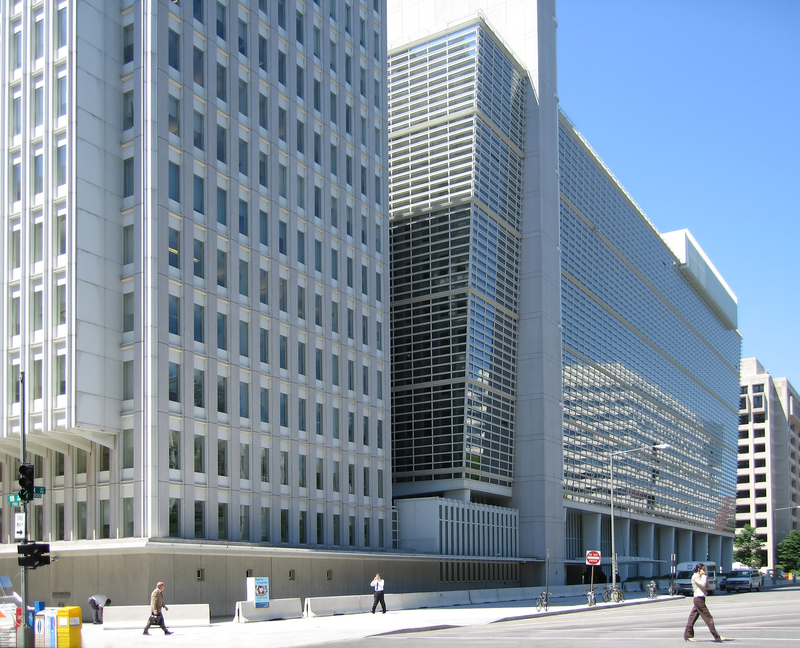 The World Bank and the IMF are both based in Washington, D.C., and work closely with each other. These changes can be attributed to Robert McNamara , who was appointed to the presidency in 1968 by Lyndon B. Johnson . : 60–63 McNamara implored bank treasurer Eugene Rotberg to seek out new sources of capital outside of the northern banks that had been the primary sources of funding. Rotberg used the global bond market to increase the capital available to the bank. One consequence of the period of poverty alleviation lending was the rapid rise of third world debt . From 1976 to 1980 developing world debt rose at an average annual rate of 20%. In 1980 McNamara was succeeded by US President Jimmy Carter 's nominee, Alden W. Clausen . Clausen replaced many members of McNamara's staff and crafted a different mission emphasis. His 1982 decision to replace the bank's Chief Economist, Hollis B. Chenery , with Anne Krueger was an example of this new focus. Krueger was known for her criticism of development funding and for describing Third World governments as " rent-seeking states." Beginning in 1989, in response to harsh criticism from many groups, the bank began including environmental groups and NGOs in its loans to mitigate the past effects of its development policies that had prompted the criticism. : 93–97 It also formed an implementing agency, in accordance with the Montreal Protocols, to stop ozone-depletion damage to the Earth's atmosphere by phasing out the use of 95% of ozone-depleting chemicals, with a target date of 2015. Since then, in accordance with its so-called "Six Strategic Themes", the bank has put various additional policies into effect to preserve the environment while promoting development. For example, in 1991 the bank announced that to protect against deforestation, especially in the Amazon, it would not finance any commercial logging or infrastructure projects that harm the environment. 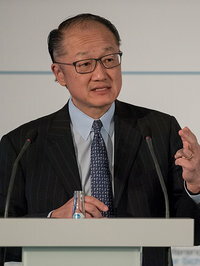 On 23 March 2012, U.S. President Barack Obama announced that the United States would nominate Jim Yong Kim as the next president of the Bank. 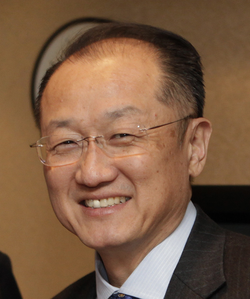 Jim Yong Kim was elected on 27 April 2012. Eradicate Extreme Poverty and Hunger : From 1990 through 2004 the proportion of people living in extreme poverty fell from almost a third to less than a fifth. Although results vary widely within regions and countries, the trend indicates that the world as a whole can meet the goal of halving the percentage of people living in poverty. Africa's poverty, however, is expected to rise, and most of the 36 countries where 90% of the world's undernourished children live are in Africa. Less than a quarter of countries are on track for achieving the goal of halving under-nutrition. Achieve Universal Primary Education : The percentage of children in school in developing countries increased from 80% in 1991 to 88% in 2005. Still, about 72 million children of primary school age, 57% of them girls, were not being educated as of 2005. Promote Gender Equality : The tide is turning slowly for women in the labor market, yet far more women than men- worldwide more than 60% – are contributing but unpaid family workers. The World Bank Group Gender Action Plan was created to advance women's economic empowerment and promote shared growth. Reduce Child Mortality : There is some improvement in survival rates globally; accelerated improvements are needed most urgently in South Asia and Sub-Saharan Africa. An estimated 10 million-plus children under five died in 2005; most of their deaths were from preventable causes. Improve Maternal Health : Almost all of the half million women who die during pregnancy or childbirth every year live in Sub-Saharan Africa and Asia. There are numerous causes of maternal death that require a variety of health care interventions to be made widely accessible. Combat HIV/AIDS, Malaria, and Other Diseases : Annual numbers of new HIV infections and AIDS deaths have fallen, but the number of people living with HIV continues to grow. In the eight worst-hit southern African countries, prevalence is above 15 percent. Treatment has increased globally, but still meets only 30 percent of needs (with wide variations across countries). AIDS remains the leading cause of death in Sub-Saharan Africa (1.6 million deaths in 2007). There are 300 to 500 million cases of malaria each year, leading to more than 1 million deaths. Nearly all the cases and more than 95 percent of the deaths occur in Sub-Saharan Africa. Ensure Environmental Sustainability : Deforestation remains a critical problem, particularly in regions of biological diversity, which continues to decline. Greenhouse gas emissions are increasing faster than energy technology advancement. Develop a Global Partnership for Development : Donor countries have renewed their commitment. Donors have to fulfill their pledges to match the current rate of core program development. Emphasis is being placed on the Bank Group's collaboration with multilateral and local partners to quicken progress toward the MDGs' realization. The International Bank for Reconstruction and Development (IBRD) has 189 member countries, while the International Development Association (IDA) has 173 members. Each member state of IBRD should be also a member of the International Monetary Fund (IMF) and only members of IBRD are allowed to join other institutions within the Bank (such as IDA). For the poorest developing countries in the world, the bank's assistance plans are based on poverty reduction strategies ; by combining a cross-section of local groups with an extensive analysis of the country's financial and economic situation the World Bank develops a strategy pertaining uniquely to the country in question. The government then identifies the country's priorities and targets for the reduction of poverty, and the World Bank aligns its aid efforts correspondingly. World Bank organizes Development Marketplace Awards , a competitive grant program that surfaces and funds innovative, development projects with high potential for development impact that are scalable and/or replicable. The grant beneficiaries are social enterprises with projects that aim to deliver a range of social and public services to the most underserved low-income groups. Together with the World Health Organization , the World Bank administers the International Health Partnership (IHP+). IHP+ is a group of partners committed to improving the health of citizens in developing countries. Partners work together to put international principles for aid effectiveness and development cooperation into practice in the health sector. IHP+ mobilizes national governments, development agencies, civil society and others to support a single, country-led national health strategy in a well-coordinated way. The World Bank Institute (WBI) creates learning opportunities for countries, World Bank staff and clients, and people committed to poverty reduction and sustainable development. WBI's work program includes training, policy consultations, and the creation and support of knowledge networks related to international economic and social development. Clean Air Initiative (CAI) is a World Bank initiative to advance innovative ways to improve air quality in cities through partnerships in selected regions of the world by sharing knowledge and experiences. It includes electric vehicles . Initiatives like this help address and tackle pollution-related diseases . The World Bank hosts the Open Knowledge Repository (OKR)  as an official open access repository for its research outputs and knowledge products. Some critics, most prominently the author Naomi Klein , are of the opinion that the World Bank Group's loans and aid have unfair conditions attached to them that reflect the interests, financial power and political doctrines (notably the Washington Consensus ) of the Bank and, by extension, the countries that are most influential within it. Among other allegations, Klein says the Group's credibility was damaged "when it forced school fees on students in Ghana in exchange for a loan; when it demanded that Tanzania privatise its water system; when it made telecom privatisation a condition of aid for Hurricane Mitch; when it demanded labour 'flexibility' in Sri Lanka in the aftermath of the Asian tsunami; when it pushed for eliminating food subsidies in post-invasion Iraq". The World Bank Group headquarters bldg. in Washington, D.C.
All information for World Bank's wiki comes from the below links. Any source is valid, including Twitter, Facebook, Instagram, and LinkedIn. 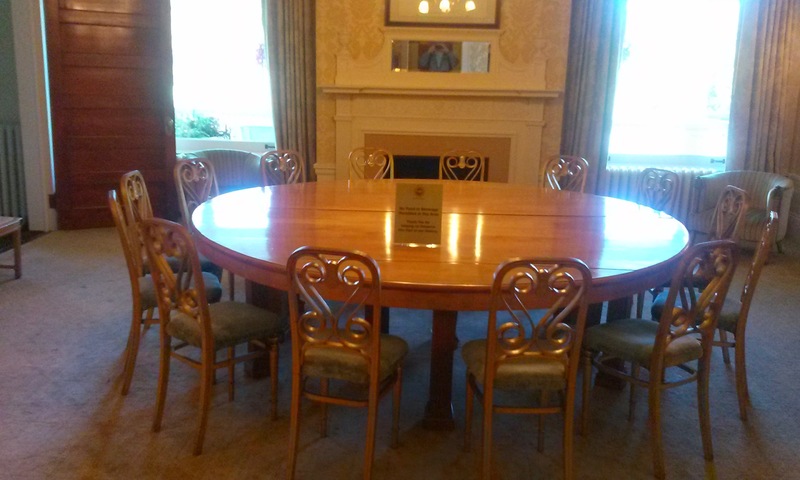 Pictures, videos, biodata, and files relating to World Bank are also acceptable encyclopedic sources. "Why Jim Yong Kim would make a great World Bank president"
"About - The World Bank - IATI Registry"
"Endogenous Legal Traditions and Economic Outcomes"
"World Bank names US-nominated Jim Yong Kim as president"
"France, Germany and Italy Say They'll Join China-Led Bank"
"World Bank Historical Chronology: 1970–1979"
"Financial Operations of the World Bank"
"President Obama Announces U.S. Nomination of Dr. Jim Yong Kim to Lead World Bank"
"Wolfowitz Laid Out Terms for Partner's Pay Package"
"Developing nations get more say in World Bank affairs"
"China given more influence in World Bank"
"World Bank: More responsibility for developing countries"
"Britain Overtakes U.S. as Top World Bank Donor"
"Climate Change in Nashville: A Gathering Storm for the World Bank?" "New Report Examines Risks of 4 Degree Hotter World by End of Century"
"World Bank Is Opening Its Treasure Chest of Data"
"SPARC Innovator: The World Bank"
"World Bank Entry in re3data.org"
"Europe: Norway: Protests As World Bank Meets"
"Violence Erupts at Protest in Georgetown"
"Amazon Indians Attack Official Over Dam Project"
"Treacherous conditions: How IMF and World Bank policies tied to debt relief are undermining development"
"The World Bank has the perfect standard bearer"
"The World Bank and the Question of Immunity"
"Extraterritorial Jurisdiction and Sovereign Immunity on Trial: Noriega, Pinochet, and Milosevic – Trends in Political Accountability and Transnational Criminal Law"
"WB channels Delhi water for PWC"
"A.W. Clausen, Former Bank of America Chief, Dies at 89"
"Tom Clausen, BofA, World Bank head, dies"
Other wiki pages related to World Bank.